Blending is a beautiful thing. Go to a beach in Brazil and dare to refute that claim. Blends of ideas and cultures give us the gestalt of advancement. Sometimes it's a Canadian making a new whiskey, sometimes it's a Dane (Brahe), a German (Kepler), and a Briton (Newton) whose combined ideas explained the universe. Argentine Alejandro DeTomaso needed money to fund his racing teams of Formula Twos and Juniors, so he blended race technology with the needs of the streets and created the world's first mid-engine production car on his very first attempt. DeTomaso went with what he knew. His first street-legal car would have a steel spine frame, four-wheel disc brakes, and use the 1.5-liter Kent engine from the Ford Cortina. The engine featured twin side-draft Weber carbs and produced 105 hp in a car that had a 90-inch wheelbase and would eventually weigh only 1,544 pounds. An unequal-length wishbone suspension with the same uprights used in the Lotus Seven and Elan and the Triumph Spitfire were used up front with a reversed lower wishbone, top link and radius arm suspension bolted to the motor and transaxle in the rear, all fully adjustable. It would be a Formula Ford for civilian duty. More photos at European Car magazine. The Argentine with the American wife living in Italy contacted Fissore to craft the first example of the car in 1962. It was first seen as a roadster, but that idea was scrapped in favor of a coupe. Steel outriggers would lead to an aluminum body with an amazingly open greenhouse of roughly 50/50 glass and Perspex. A spat between DeTomaso and Fissore lead to the actual production of the car being handled in 1964 by Ghia, which would later become DeTomaso property. Aluminum bodywork became fiberglass, a mid-engined car for the strada took its final form, and it was given a name: Vallelunga, after an Italian racetrack favored by DeTomaso. The first examples in 1965 used a four-speed VW transmission, but later models were given five forward cogs. Top speed was about 130 mph — damn respectable for a four-cylinder car of the era. The Vallelunga danced. The stiff spine frame, potent brakes, low weight and sturdy motor combined to make the car an extension of the driver's will. Canny engine placement allowed for nearly uninterrupted vision. Look hard at every mid-engine car to follow it and you won't find one with such excellent sight lines. That placement also puts the Kent about a foot from the driver's head, but honestly: Who doesn't like a screamer? Another spine chassis, mid-engine car, Lotus' Europa, would debut in show rooms the following year, but the Argentine model is clearly the more beautiful of the two to my eyes. The styling owed something to the Ferrari 250LM, no doubt, but was good enough as a whole that the Vallelunga was shown at New York's Museum of Modern Art as "an example of technological progress and outstanding design." For all this, the Vallelunga didn't sell. Three prototypes, fifty cars built by Ghia and five Competizione lightweights tuned up to 130 hp are the entire production run. DeTomaso's eyes turned the development of his next blend of American power and Italian style, the V8 Mangusta. 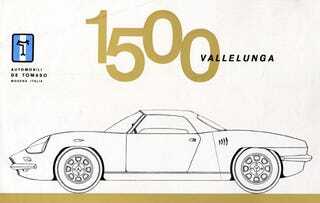 The agile Vallelunga, the car that established the DeTomaso brand, is hardly known. Its rarity puts its current day value at about $135,000. A 43-inch tall car (about two inches shorter than an Elise), Alejandro's first car is a giant in the history of automotive development.